While publishers are grumbling about Apple’s (s AAPL) new enforcement of in-app purchases for content, parents and one lawmaker are also raising questions about the way Apple handles in-app payments in apps aimed at children. According to the Washington Post, Rep. Edward J. Markey (D – MA) on Tuesday urged the Federal Trade Commission to review the way Apple markets its apps because of questions about the ease with which children are buying items in games. The issue stems from a story in the Washington Post that showed how children were racking up big in-app purchases inside freemium iOS apps to the surprise of parents. My colleague Kevin wrote about this issue earlier after his step-daughter charged up $375 worth of virtual goods buys in a gaming app. There are parents controls that can limit children’s ability to make purchase, but there is still one glaring loophole: if a parent enters their iTunes password for a purchase and hasn’t restricted in-app payments, children using that device can make purchases for the next 15 minutes without having to enter a password. One woman’s daughter in the original Post story racked up $1,400 in charges on her mother’s iTunes account, through Smurfberries purchases in the Smurfs’ Village app. The woman later received a reimbursement, but the issue paints the in-app purchase boom in a new light. A report by app analytics company Distimo found that in-app purchases rivaled paid downloads as the top revenue source for developers last year. While many games and apps are utilizing in-app purchase, some of the most successful are titles from social game makers. 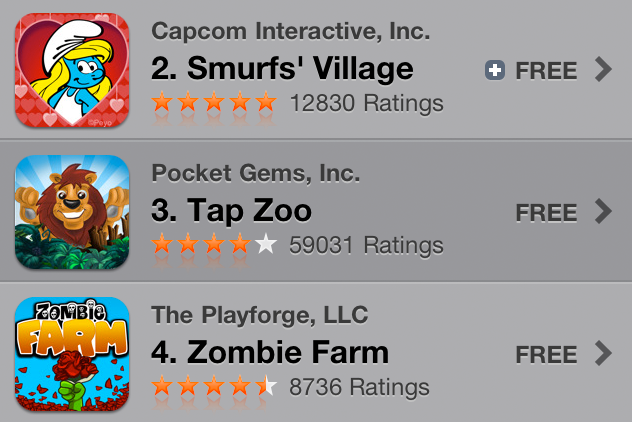 Of the top five grossing iPhone apps right now, three (Smurfs’ Village, Tap Zoo and Zombie Farm) all use in-app purchases. Smurfs’ Village and Tap Zoo are rated for 4-year-olds and up while Zombie Farm is rated for 9-year-olds. Technically, Apple says iTunes users must be 13 years old. In talking to some developers, they said this is an area they’d like to see Apple address. One said they would like to build in more protections for children and parents to prevent inadvertent purchases within the 15-minute window but they must work within Apple’s current rules. Smurfs’ Village and Tap Zoo have recently added warnings that virtual goods use actual money. I imagine Apple will address this either by implementing a new setting option for parents, or they’ll renew their efforts to advertise the existing parental settings. But I doubt Apple will try to close the overall 15-minute window for all transactions because it would stifle purchases and add one more hurdle to impulse buys. The App Store sells because it’s elegant, easy to use and there are few barriers to buying. And changing that would jeopardize Apple’s 30 percent cut of all in-app purchases. In the end, this won’t be a major issue as long as Apple addresses it soon and parents wise up. As my colleague Colin Gibbs pointed out (subscription required), this is the early days of in-app payments and it’s in Apple’s best interest to establish more safeguards to assure parents. He drew a comparison to ringtones, which got a scammy reputation for going after underage consumers. I don’t think we’ll see in-app purchases decline in the way ringtones have but I do think that it makes sense to step up with more warning labels or spending limits to ensure nothing slows down the overall acceptance of legitimate in-app purchases. This is a big opportunity for both Apple and developers. Now it’s just a matter of making sure the store remains an inviting place to do business for everyone involved. Actually till the app maker does anything it is parents duty to keep a close watch on kids’ activities. This will save their money. no question of bringing the credit card company here. Rather than blame the parents for giving their kids control over their credit card, look at it from this perspective. Your kid annoys you for the cool app to play that his buddy has on his Mom’s iPhone while in a waiting room so you sign in and download the game. The kid starts playing, and is prompted in the tutorial about these berries that let him do more and have more fun. Now, this is just 10 minutes after buying a ‘free’ app and unless you know exactly what’s coming you haven’t found that secret menu yet, so your kid can buy berries for the next five minutes. The parent didn’t give the kid any information, neither credit card or password related. Even knowing all this it took me about 10 minutes to find the menu and disable the feature, but now if I want to make an in app payment I need to go all the way back and flip the switch again. Not all parents buy their 10 year olds iPhones, many just let them use it while they’re out doing errands or diving. It’s a feature that the kids simply can’t comprehend, and parents are just now becoming aware of. To defend the companies that make most of their money off of this is stupid, just like defending a marker making company that charges $0.50 for every color outside of the starting 10 colors yet promising every possible color for your coloring book. But it isn’t their fault. Everyone is at fault in this vase with the blame on nobody, the developer for making it possible, Apple for not doing anything to warn or help parents prevent it, Parents for not knowing about the apps they give their kid, and then Kids for not understanding what’s going on. Give it a few months and this won’t ever happen again. Actually, I would go so far as to say that it IS entirely the parents’ fault. They’re the ones that need to monitor their kids. Apple, or any similar company, can’t play the role of parent and take responsibility for the actions of these kids, regardless of who the apps are aimed at. Besides, Apple doesn’t directly create the apps, does it? I’m not an app user so I just know what I see from a distance, but I thought they were mostly third-party creations. Actually, I really wish that they would remove the apps for adult audiences and put them is a seperate bin that requires the user to be 18 or older to access. Yes, you can set the parental features, but seperating this garbage from the rest of the population is an easier solution. Android is worse in this area. I hate to say it, but those screaming internet free speech for these apps need to get a life. Seperate the garbage out and keep things clean..
My trouble is that it is necessary to enter your password to get *free* updates. I have to do this for iTunes and for the App Store and for the next 15 minutes (while I wait for the terribly slow updates to download) it is way too easy to buy things, even by accident. It should *not* be necessary to enter your password to get free updates to apps you have already purchased. Free updates should be um… FREE, no password required. Next up lawmakers make laws because parents are lazy. Parents can be distracted, but fortunately, there IS technology available that should be integrated/employed to make sure that there is protection for consumers/families alike. It’s always a slippery slope when you see politicians get involved where common sense should reign. Companies like Media Chaperone are focused on applications to make sure that breaches like ‘massive monetary expenditure on Smurfberries’ are non-existent. I hope things improve before my little ones start using my iPhone or iPad! I totally disagree. If as a parent you are stup*d enough to allow you children access to itunes passwords you deserve to be charge in full for thier purchases. All it takes is a phone reboot to lock your kids out of your itunes passwords. Going this route, should credit card companies come under fire because the children tookthe parents credit card and ordered a couple ipads online? Too bad you can’t spell. And I’m 14. “there is still one glaring loophole: if a parent enters their iTunes password for a purchase and hasnâ€™t restricted in-app payments” Its obvious if you share your iphone with other people. Restrict in-app payments! Simple solution: STOP BEING A LAZY PARENT!